Meet Brown the least used pencil in the box. He’s tall, geeky and lonely. Brown envies Red, Purple, Blue and all the other pencils who have fun coloring and playing together. Dark Green is trustworthy, Pink listens well, Orange has fun, and everybody likes Red! Brown doesn’t smile very often because he doesn’t get used much and hardly ever needs sharpening. When Brown asks the other pencils why no one likes him, he discovers that to have friends, he needs to be a good friend. If Brown learns to use all of the friendship skills the other pencils have, he can make friends and have fun too! 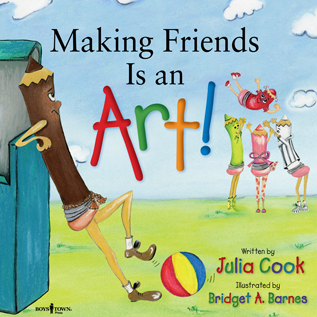 In her trademark humorous fashion, author Julia Cook teaches kids of all ages (and adults too!) how to practice the art of friendship and getting along with others. The book includes tips for parents and teachers on how to help children who feel left out and have trouble making friends. It’s the first in a Building Relationships series of books from Boys Town Press, and it focuses on relationship-building skills for children.